A chef once told me she could tell if someone could cook within a few seconds of seeing them hold a knife. I immediately put down the knife I was wielding, terrified of failing the test. But it left me wondering: I've been using a knife for five decades, cooking up to a dozen times a week. But am I actually any good at it? As I stand by a bench with a dozen other amateur cooks inside New York's Institute of Culinary Education, I'm about to get my answer. "Pick up your knives," instructor Sue Gonsalves tells us students, casting her eye around the table. She pauses beside me and delivers her verdict – I'm holding it wrongly, with my pointer finger extended along the top of the knife, the spine. "If you do that, you're creating pressure on your wrist, elbows and upper shoulder," she tells the class. Gonsalves gently repositions my fingers so my pointer and thumb pinch the knife's blade, my other fingers wrap around the handle. "Ninety-five per cent of home cooks hold their knives incorrectly," she tells me, reassuringly. "Most people have bad old habits when it comes to knives." Who knew that to use a knife properly, you have to start with your feet. I'm on holiday and a long way from home. If I keep my mouth shut, no one need ever know my shameful secret. For three hours Sue takes us through chopping and dicing, mirepoix and peeling. As the institute's course notes say, "Knowing how to use knives skilfully is the foundation of all cooking". Turns out I've even been using a vegetable peeler wrongly, too ... you peel backwards and forwards, not one-way along the carrot. So, from my class and a chat with Gonsalves, who's been teaching knife skills to amateurs and pros for several years, here's a rundown of knife essentials. "Get yourself a good knife, whether affordable, or high-end, and ask to hold it to make sure it feels comfortable before you buy," says Gonsalves. She's a fan of bigger knives, saying 25.5-centimetre or 30.5-centimetre knives give you more control (20 centimetres is the most common knife size). Home cooks will get by with a 20-25 centimetre knife, a small paring knife, and a serrated knife. The main knife would usually be heavier, German and stainless steel, but some cooks will prefer a lighter Japanese-style knife. "Stainless steel is most practical for home books, but carbon steel is lighter," she says. Who knew that to use a knife properly, you have to start with your feet. "Many home cooks stand side-on to a chopping board," when they should "stand front on, with a good stance," about five centimetres from the chopping board, Gonsalves says. To hold a knife properly, pinch the blade between your thumb and index finger. Holding the blade gives you more control. "Use a relaxed pressure on the handle," Gonsalves says. When you rest your knife on the chopping board, lay it along the back of the board with the blade facing away from you. Anchor your chopping board by placing a wet paper towel beneath it to stop it from moving around on the bench. Keep a damp tea towel handy beside you to wipe your knife, hands and chopping board between ingredients. Keep your chopping area uncluttered ... scrape offcuts and peel into a container by your chopping board. Simmer these for 45 minutes to make stock, then strain and freeze it in ice cube trays for four months. Or simply put the scraps into a ziplock bag and freeze to add to stock later. Steady the food you're about to chop by making your hand into a "bear claw" – fingertips curved under, thumb tucked behind fingers. 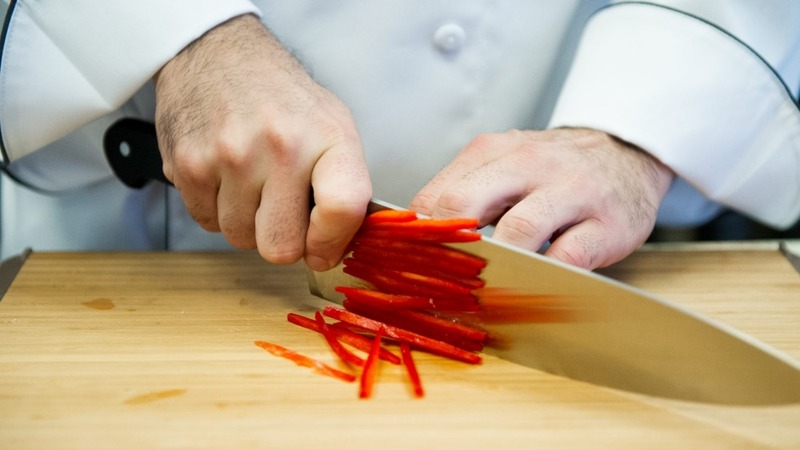 When chopping, unless you're doing it Asian style, the tip of the knife stays on the board, the body of the blade rises and lowers, with your hand pushing the knife to slide forward. "It's a rocking motion, and very therapeutic," Gonsalves says. Gonsalves chops quickly while looking us in the eye … there's no danger of her losing any fingers because she rests the knuckles of her guiding hand against the blade of the knife as she chops, so nothing but food ends up under the blade. "The stone is the boss," when it comes to sharpening, says Gonsalves, but if you're unsure how to use one, buy a hand-held knife sharpener with two slots, one coarse, one fine. 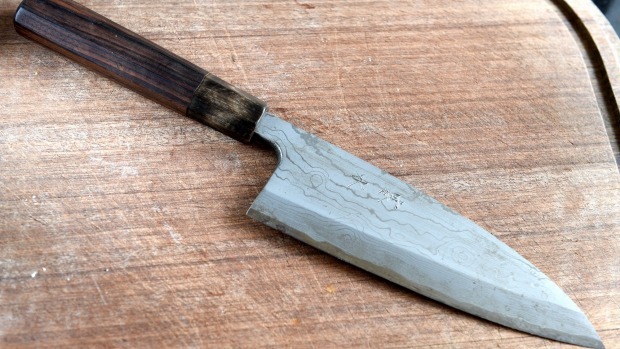 Her rule of thumb: if you cook three or more times a week, sharpen your knives monthly. And hone your knives on a honings steel every time you pick them up to start work. Another piece of new information for me – serrated knives don't ever need sharpening. "The more you use them, the sharper they remain," Gonsalves says. She urges hand-washing and drying knives the minute you finish using them. Avoid dishwashers, mainly because knives can damage the racks, or cut you when you're emptying a load. A $2 kitchen tool may become your most-used gadget. You should never scrape food from your chopping board with your knife, Gonsalves warns us. Instead, buy a pastry scraper – plastic ones cost about $2 – and use it to scrape food and scraps into a bowl from the board. A pastry scraper is "the best thing ever" for home cooks, Gonsalves says. It cleans a bench of scraps or dough, cuts butter and cuts and helps rotate dough, aside from being an invaluable sidekick for your knife. Every chef has a favourite method. Here's Sue Gonsalves'. 1. Leave the root end on and slice off the stem end. 2. Cut the onion in half vertically. 3. Peel off the first two layers and save for stock. 4. Lay the halves on the board flat side down. 5. Using the tip of the knife, slice vertically first, starting one centimetre from the root end. 6. With your palm on top of the onion, and your fingers flat or bent up to keep them out of harm's way, then slice horizontally. 7. Finally, hold the onion with your "bear claw" grip and dice it by slicing from the stem end back towards the root. Voila! Evenly chopped onion, fingers intact. Knife Skills 1 is run throughout the year for amateur cooks by the Institute of Culinary Education in Lower Manhattan. The three-hour course costs $US105 ($132). See recreational.ice.edu.